January 27, 2017 Eros, Windhoek, Namibia - Along with the depressing headlines in December 2016 about the rapid decline of cheetahs came more headlines that giraffes have lost nearly half their population in just the last 30 years and are now also facing the risk of extinction this century. We have all been hearing about Earth being in a 6th mass extinction because of human impact on once-natural habitats that are being developed for farms or houses or other human needs. 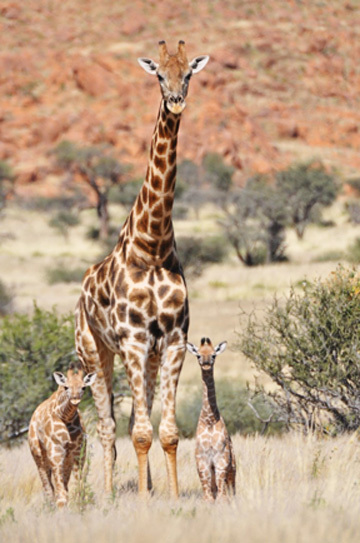 The International Union for the Conservation of Nature, the IUCN, reported in early December 2016 that the number of species now on its Red List totals more than 85,000, with more than 24,000 at risk of extinction — including the world's tallest animal, the giraffe. Previous PostPrevious Only 7,000 Cheetahs Left In World — 21st Century Extinction? Next PostNext Are Color-Modulated Rapid Pulses from 234 Stars E.T. Signals?